Director Im Heung-soon returns for his third feature, casting his artistic light on another under-served segment of the population with the documentary Ryeohaeng. Focusing on the lives of several female North Korean defectors in Korea, Im contrasts talking heads positioned in some unusual locations with dreamy reveries and musical sequences. The NK refugees, who are quickly introduced less through their backgrounds than their personal quirks, range in age but are united in a desire that led them to leave the hermit kingdom. Some have been in the South for decades, others only a few years, but all talk about their surprise upon arriving south of the border and finding it to be worlds away from the backwater hellhole that their government had warned them about. The paths that led them all to South Korea (generally by way of China) are similar, though some take a darker turn in human trafficking. They diverge further once they reach the southern part of the peninsula, as each ends up in a different line of work. Yet, notably, many of the women show an artistic side, whether seamstresses with a keen interest in fashion or aspiring actresses. 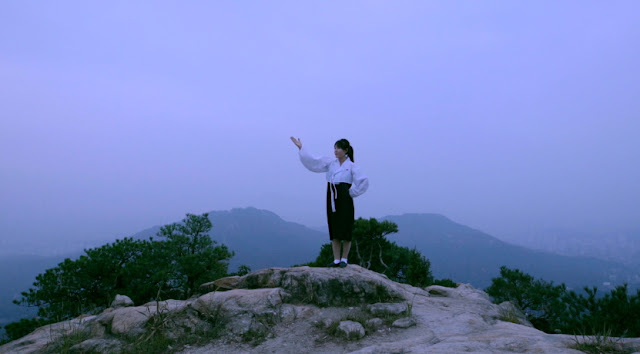 Two women walk through the mountains near Anyang, a city that is reputed to be place to find comfort (and whose government partly financed the work), and one practices her acting in front of the other, wearing full hanbok (traditional Korean costume). Before we know it, we're whisked into a fictional scene of the same women running through the woods and hiding in a village of old huts after darting past a table, from under which the feet of a corpse poke out. Each character has something interesting to say, but if that wasn't enough, director Im frames them in unexpected ways, highlighting the alienness of their experiences and their undefined roles in a foreign country that, not so long ago, they might have called home. One woman sits barefoot at night in a red plastic chair placed in the middle of a stream. Another woman's jerky hand gesticulations project shadows which jut around the face of a large, coarse boulder. Ryeohaeng is an elegant film that finds purpose in its subject and the unusual way it frames it, just as in the style of Im's previous documentaries, yet it's also a smaller work that opts to stay within its thin scope. It presents a small group of people and the common issues that bind them but never attempts to dig too deeply into the admittedly bigger topics it dances around. It's no Factory Complex, but cements Im's status as a leading figure in Korea's documentary scene.